Vivian Vance (July 26, 1909 – August 17, 1979) was an American Emmy Award-winning television actress, theater actress, and singer. She is often referred to as "TV’s most beloved second banana," because she is best known for her role as sidekick Ethel Mertz on the landmark American television sitcom, I Love Lucy. She was a former Broadway showgirl who, between 1932 and 1947, appeared mostly, with varying degrees of success, in stylish New York staged musicals and comedies. Just prior to being signed to play Ethel Mertz in 1951, Vance made her screen debut, appearing in two films: The Secret Fury (1950) and The Blue Veil (1951). At the age of 42, she became an internationally recognized TV star. In 1954, Vance became the first actress to win an Emmy Award as "best supporting actress" for her role of Ethel Mertz. She was nominated three more times before the end of the series. Plagued by crippling bouts of depression during her stage career, Vance was one of the first celebrities to speak openly about mental illness. Born Vivian Roberta Jones in Cherryvale, Kansas, Vivian was the second of six children born to the Welsh-Irish-English couple, Robert Jones and Euphemia Ragan. When she was six years old, her family moved to Independence, Kansas, where she eventually began her dramatic studies under the tutelage of Anna Ingleman and William Inge. Vance had a close-knit relationship with her younger sister, Dorothy Jones. Although six years younger than Vance, Dorothy shared the same sense of humor and vivacity, stating, "The main thing was how wonderful she was. There was never anything mean about her. She was kind and generous. She loved everybody and everybody loved her." Her love of acting clashed with her mother's strict religious beliefs, and it wasn't too long before Vivian, nicknamed "Viv" by friends, became very rebellious, often sneaking out of her bedroom and staying out after curfew. While life was tense at home, Vance discovered her love for singing and dancing at Independence High School, under the tutelage of her drama teacher, Anna Ingleman. In addition, Vance was a cheerleader in her high school and took part in various beauty contests. She soon changed her surname to Vance (after folklorist Vance Randolph) and moved to Tulsa, Oklahoma, to find work as an actress while her family relocated to Albuquerque, New Mexico. As fate would have it, Vance wed a fellow theater worker, Joseph Danneck Jr., and settled in Albuquerque. The marriage crumbled soon thereafter, as she moved back in with her family and began to audition at the Albuquerque Little Theatre. Through a series of successful performances in showcase parts, Vivian began getting major attention from reviewers in the area. Her success in Albuquerque provided her the money she needed to study under Eva Le Gallienne in New York City. After divorcing her first husband, she moved east in 1932. She initially had trouble finding stage work, but this soon changed when she began a two-year stint in Jerome Kern and Oscar Hammerstein's Broadway musical Music in the Air (1932). It was at this time that she married musician George Koch. Vance next understudied Ethel Merman in the Cole Porter musical Anything Goes (1934). Her first starring role was as Kay Thompson's last-minute replacement in Hooray for What! (1937). In 1941, Vivian, now twice divorced, married actor Philip Ober and remained married to him until 1959. In 1945, while starring in a touring company of The Voice of the Turtle, she suffered a nervous breakdown. Recalling her state in a 1955 McCall's article, Vance said, "…I flipped. One day I was up and around… The next I was lying in bed in my hotel room, my hands shaking helplessly, in violent nausea, weeping hysterically from causes I did not know…." After undergoing therapy, Vance made a recovery and found work in two Hollywood movies—The Secret Fury (1950) and The Blue Veil (1951), in which she played supporting roles. She later returned to The Voice of the Turtle at the La Jolla Playhouse near San Diego, California. When Desi Arnaz and wife Lucille Ball were casting their new television sitcom I Love Lucy in 1951, director Marc Daniels, who had previously worked with Vance in a theater production, suggested her for the role of landlady Ethel Mertz. She was not the first choice, however. Lucille Ball wanted actress Bea Benaderet, a close friend. Because of a prior acting commitment, Benaderet had to decline playing the role. Arnaz then began searching for another actress. Daniels took Arnaz, along with producer Jess Oppenheimer, to see Vance in The Voice of the Turtle; while watching her perform, Arnaz was convinced he had found the right woman to play Ethel Mertz. Ball was less sure, since she had envisioned Ethel as much older and less attractive. In addition, Ball, firmly entrenched in film and radio, had never heard of Vance, primarily a theater actress. Nonetheless, the 42-year-old Vance was given the role on the innovative new television program, which debuted October 15, 1951, on CBS. Vance's Ethel Mertz character was the less-than-prosperous landlady of a New York City brownstone, owned by her and husband Fred Mertz. The role of Fred was played by William Frawley, who was 22 years her senior. While the actors shared great comedic and musical chemistry on-screen, they did not get along in real life. According to some reports, things first went sour when Frawley overheard Vance complaining about his age, stating that he should be playing her father rather than her husband. Others recall that Frawley loathed Vance practically on sight. Vance, in turn, was put off by Frawley's cantankerous ways, in addition to his age. Eventually, Ball overcame her resistance to Vance, and the two women formed a close friendship. 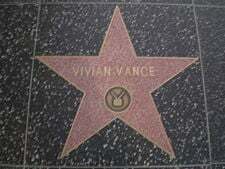 Honored for her work in 1953, Vance became the first actress to win an Emmy Award for "Outstanding Supporting Actress." Vance accepted her award at the Emmy ceremony in February 1954. She was nominated an additional three times (for 1954, 1956, and 1957) before the end of the series. In 1957, after the highly successful half-hour I Love Lucy episodes had ended, Vance continued playing Ethel Mertz on a series of hour-long specials titled The Lucille Ball-Desi Arnaz Show (later retitled The Lucy-Desi Comedy Hour). In 1959, she divorced her third husband Philip Ober, who allegedly physically abused her. When the hour-long Lucy-Desi specials ended production in 1960, Vance and Frawley were given the opportunity to star in their own "Fred and Ethel" spin-off show. Although Frawley was interested, Vance declined. In 1960, Vivian appeared in a pilot for a new sitcom titled Guestward Ho! The pilot didn't sell, and a year later she married literary agent John Dodds. Despite rumors that Dodds was gay, the marriage seemed to work. The couple set up their home in Stamford, Connecticut. In 1962, when Lucille Ball was planning to return to television in a new series, she asked Vance to rejoin her. Vance reluctantly agreed, with the stipulation that she be allowed to appear in more glamorous clothes, as well as having her character be named "Vivian" (as she was tired of the public addressing her as "Ethel"). She appeared on The Lucy Show from 1962 until 1965, as Vivian Bagley, a divorced mother of one son, sharing a house with Ball's character. The character of Vivian Bagley was the first divorcee ever on a weekly American television series. The strain of commuting from her home in Connecticut to Hollywood was too hard on her, however. By 1964, she appeared in only half of the episodes. The following year, she was offered a new contract with Desilu Studios, giving her the opportunity to direct. This never came to fruition, though, when Vance could not reach an agreement on salary. She made a handful of guest appearances on the remaining seasons of The Lucy Show. After her departure from The Lucy Show, Vance appeared occasionally alongside Lucille Ball on reunion shows and made several guest appearances on Ball's third sitcom, Here's Lucy (1968-1974). In 1969, Vance returned to Broadway and starred in the comedy My Daughter, Your Son. In 1973, Vance was diagnosed with breast cancer. The following year, she and her husband moved to Belvedere, California, so she could be near her sister. It was during this period that Vance played the part of "Maxine," who wheeled around a catering truck, dispensing Maxwell House coffee to office workers in a series of television commercials. In 1977, Vance suffered a stroke which left her partially paralyzed. Her final television appearance with Lucille Ball was on the CBS special Lucy Calls the President, which aired November 21, 1977. Vivian Vance, who never had children, died on August 17, 1979, at the age of 70. After her death, Desi Arnaz remarked, "It’s bad enough to lose one of the great artists we had the honor and the pleasure to work with, but it’s even harder to reconcile the loss of one of your best friends." Her body was cremated, and the ashes scattered at sea. During a 1986 interview, Lucille Ball talked about watching I Love Lucy reruns and her reaction to Vance's performance: "I find that now I usually spend my time looking at Viv. Viv was sensational. And back then, there were things I had to do—I was in the projection room for some reason, and I just couldn't concentrate on it. But now I can. And I enjoy every move that Viv made. She was something." Vance is memorialized in the Lucille Ball-Desi Arnaz Center in Jamestown, New York. ↑ Elisabeth Edwards, “I Love Lucy” Cast Biographies: Vivian Vance, CBS. Retrieved September 20, 2008. ↑ Rob Edelman and Audrey Kupferberg, Meet the Mertzes: The Life Stories of I Love Lucy's Other Couple (Los Angeles: Renaissance Books, 1999, ISBN 1580630952). ↑ What A Character, Vivian Vance. Retrieved September 20, 2008. ↑ 4.0 4.1 4.2 4.3 Ed Stephan, Biography for Vivian Vance, Internet Movie Database. Retrieved September 20, 2008. ↑ Vivian Vance, I Don't Run Away Anymore, McCall's. Retrieved September 20, 2008. ↑ Michael Karol, I Love Lucy. Retrieved September 20, 2008. ↑ Barbara and David P. Mikkelson, Weighty Matters. Retrieved September 20, 2008. ↑ Libby Pelham, I Really Love Lucy. Retrieved September 20, 2008. ↑ Mike Spadoni, TV Greats and Unsung Heroes: Vivian Vance. Retrieved September 20, 2008. ↑ JH Chris, Vivian Vance: A Biography. Retrieved September 20, 2008. ↑ Find a Death, The Death of William Frawley and Vivian Vance. Retrieved September 20, 2008. Castelluccio, Frank, and Alvin Walker. 1998. The Other Side of Ethel Mertz: The Life Story of Vivian Vance. Manchester, CT: Knowledge, Ideas & Trends. ISBN 1879198266. CBS Television Network, Lucille Ball, and Desi Arnaz, Desi. 2003. I Love Lucy. Paramount Pictures. ISBN 0792187296. Edelman, Rob, and Audrey Kupferberg. 1999. Meet the Mertzes: The Life Stories of I Love Lucy's Other Couple. Los Angeles: Renaissance Books. ISBN 1580630952. All links retrieved January 23, 2016. Advance Review:"The Other Side of Ethel Mertz" Lucilleball.net. Shaeffer Pen Commercial Vivian Vance 1950's Youtube.com. Vivian Vance - I Am Lily Of The Valley Youtube.com. This page was last modified on 23 January 2016, at 16:23.